In one of the most creative pranks of all time, someone appears to have turned the floor of an ordinary elevator into an optical illusion. 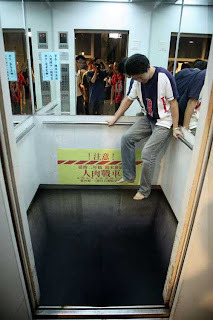 Imagine stepping inside and looking down into an empty elevator shaft! that is SO cool !!!! That would be soo cool yet scary! that looks super creepy, but that would be cool!